Looking for top convenience in a Boston airport hotel? 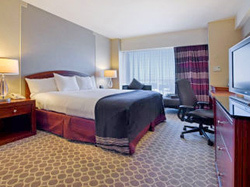 Consider the gorgeous Hilton Hotel Logan Airport, one of the best airport hotels in Boston. The Hilton Logan Airport is the only airport hotel with direct skybridge or shuttle service connections to Logan Airport's terminals, plus you'll enjoy the Boston Harbor and city skyline views offered by much pricier Downtown Boston waterfront hotels. Best of all, you can be Downtown in 8-10 minutes when you take the water taxi or subway. Designed to cater to business meetings, conferences, and weddings, the Hilton Hotel Logan Airport offers a great blend of desirable amenities, some of the same convenience that you'll find in hotels in Downtown Boston, and attractive rates. The Hilton Logan Hotel's 599 rooms are so soundproof that you won't realize that you're staying in a hotel located just steps away from where you got off your plane. Rooms are comfortably furnished and feature the super-comfortably Hilton "Serenity" beds, with Serta Perfect Sleeper Suite Dream mattresses, down comforters and pillows, and high-quality linens. Rooms also provide high-speed internet access (additional daily fee), phones with voice mail, individual climate control, coffee makers with complimentary packets of coffee and tea, and 32" flat panel LCD TVs. Most rooms have spectacular views of Boston Harbor and city skylines, especially on the upper floors. This popular Logan Airport hotel also has a huge health club and lap swimming pool. An informal dining area provides a comfortable setting for breakfast, and an on-site "pub" serves lunch and dinner. There's also a coffee bar where you can get Starbucks coffee. The Hilton Logan Hotel provides free shuttle service to Boston's subway, water taxis, and other airline terminals. Although the hotel is 2 miles from Downtown Boston by way of the Ted Williams Tunnel, a water taxi will whisk you there in 8-10 minutes, and the subway is even faster. Be sure to have your camera handy before you board the "taxi" - actually a high-speed ferry - because you'll see some magnificent views of Boston as you travel the short distance across Boston's Inner Harbor to Rowes Wharf. 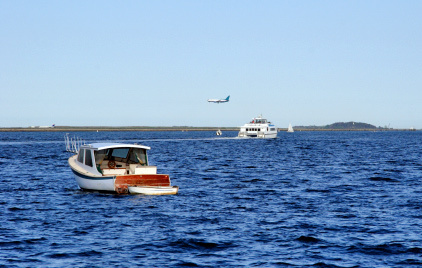 Without a doubt, this is absolutely the best way to get from Logan Airport to Downtown Boston if you love being on the water. If you don't enjoy being in boats or if the weather is bad, the subway (or "T," as we call it here in Boston) is also a great option. You can take the T's Blue Line to Central Wharf on Boston's waterfront next to the New England Aquarium, or you can continue on to wherever you want to go in the city. Once you get off the water taxi or T, you're right in the heart of historic Boston. The Freedom Trail, Boston's Italian North End, TD Garden where the Boston Bruins and Boston Celtics play, Faneuil Hall Marketplace, and many more interesting places are nearby. You'll also find lots of terrific Boston restaurants and nightspots. So if you're looking for the convenience of Logan Airport Hotels, the views of Boston waterfront hotels, and the excitement of hotels in Downtown Boston, you'll find a lot to like at the Hilton Logan Airport. You can usually find very attractive rates at the Hilton Logan Airport, especially compared with what you'd pay for many hotels in downtown Boston or Boston waterfront hotels.